This is a single-person squeegee unit that offers a high quality yet affordable solution to screenprinting short runs, prototypes, and test runs. 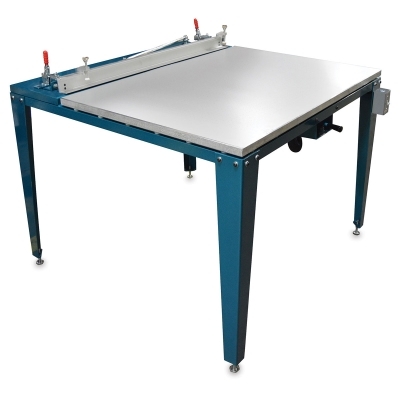 Aluminum Stay-Flat vacuum table with adjustable legs provides a flat, rust-proof, warp-proof printing surface. The vacuum holddown is powered by a maintenance-free quiet, brushless, vacuum motor. Vacuum on/off is easily controlled by the up-front hand lever system. A Screen Frame Clamping Unit has micrometer control. This unit features a heavy-duty screen lift with reversible sidekick and an ergonomically shaped all-aluminum contoured squeegee holder, which includes AWT's top-of-the-line Poly-Supreme Vulkollan squeegee blade. Sizes listed indicate print area. ® AWT is a registered trademark.™ Accu-Glide and Poly-Supreme are trademarks.